The solo swim categories are described below, along with rules pertaining to inclusion in each category. There is no distinction between genders in this race; men and women are competing against one another for placing! Non-Wetsuit Category: FINA OWS swimming guidelines apply. Athletes in this category cannot use any buoyancy aids or speed aids (no wetsuits, pull buoys, hand paddles, fins, snorkels, etc.). Rash guards, music, and dive masks are fine, however, as is any type of fabric swimsuit. Grease is also allowed. Wetsuit Category: Wetsuits are allowed; speed aids are not. a) Racers must complete the full 36 miles under their own power, uninterrupted by stops on land. In the event that a swimmer “touches bottom” in the middle of the river, they will not be disqualified as long as they don’t use the bottom for forward progress. Exceptions will be made in the event of lightning-related issues. b) Swimmers cannot have contact with their support boats or paddlers. Incidental/accidental contact won’t result in disqualification. This means swimmers can’t hang onto the boat during feeds! c) Racers must comply with directions of race personnel regarding cutoff times (below). We are not allowed to be on the river after sunset. For consistency, we're calling this a 16-hour race if start is at sunrise even though it's usually a few minutes either way. There will be two locations where we will be determining average swim pace. Pace determination and cutoff time will be based on race start time and the discretion of the volunteer staff. If you're thinking of dropping, it's a bit easier (shorter walk to a vehicle) to get out at Thompson Bridge. We will allow you to continue after Thompson Bridge if you are on pace to reach Last Chance by sunset. 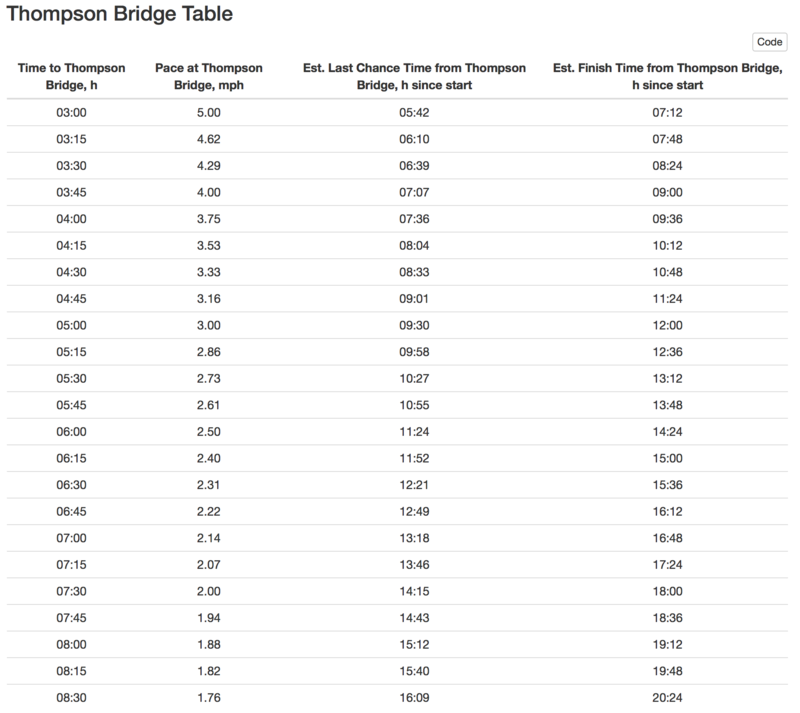 If race starts at sunrise, cutoff time at Thompson Bridge is 8:20 (8 hours and 20 minutes) since race start. We will allow you to continue after Last Chance if you are on pace to reach the finish by sunset. If race starts at sunrise, cutoff time at Last Chance is 12:40 (12 hours and 40 minutes) since race start. A map of the race course is available here. The river is varies in width from about 150 feet to more than 300 feet in places. The current averages between negligent to 1 mph or so, depending on water levels. In 2012, the river was at record low levels and most swimmers touched bottom at least once. In 2013, flows were up and times were faster and no one touched bottom. Current river conditions (including temperature) can be found here: http://waterdata.usgs.gov/nd/nwis/uv?site_no=05082500 (live discharge and temperature plots below). The visibility within the river is approximately 8 inches because of the high turbidity. The water itself is clean and safe to swim in, however. The banks are lined with majestic old cottonwoods, many sporting eagles’ nests. It's awesome! Here are some plots derived from the race results. The x-axis on both is river discharge (amount of water flowing at Grand Forks, cubic feet per second). 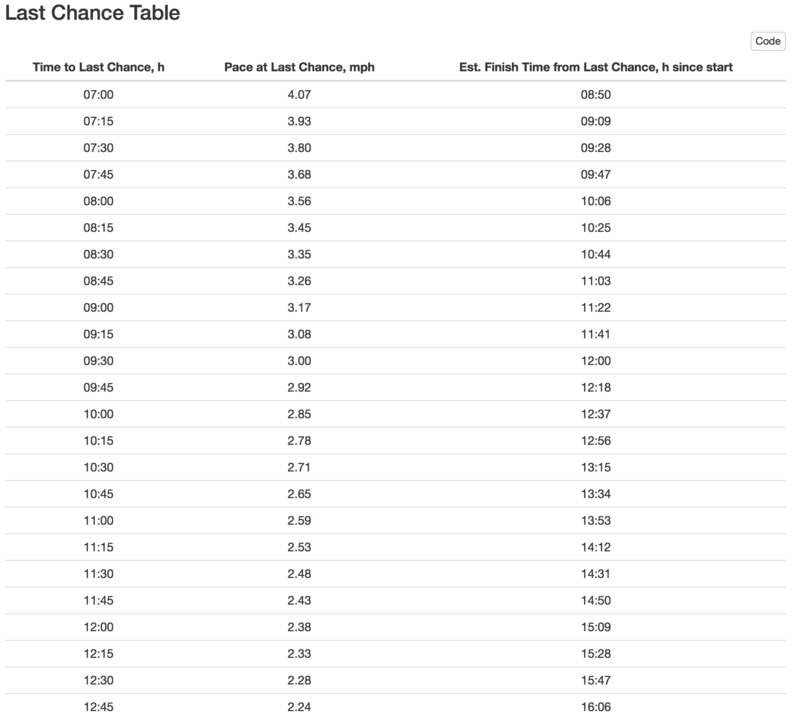 Hopefully this will give you an idea of potential speed and finish times. Logistically, supporting a swim this long is a challenge. Multiply that by 30 and add difficulty because the river is so inaccessible during most of its length, and well, you get the picture! Below are some logistical details to keep in mind. Many of our previous racers are on the Marathon Swimmers Forum (search for "END-WET") and are happy to share experiences. Swimmers: remember that this is the longest race in North America and much of the river is essentially inaccessible from the shore. Please think carefully about what you need to be successful at the race and don’t pack what you don’t need. It’s important that you have enough, but be aware that some support boats might have a limited amount of room. Nutrition should be split roughly in half, as there is a resupply point at mile 15. The resupply items should be in mesh bags (or something similar) that can be easily handed to your support boater from the shore, and must be clearly marked with your full name on them. Support boats will be able to hand off trash/empty bottles at the resupply point, but please note that anything left here should be considered abandoned. Any support paddler wanting to pick up their own items at the resupply point should add them to their swimmer’s bag. All resupply bags will be transported to the resupply point by race volunteers. For those with loved ones, friends, and fans following along, we plan to offer live updates during the race. We are using track.rs for livetracking (for the first time in 2017, so please bear with us). Racers will be using a mix of mobile phones and satellite trackers in support boats. This is an opt-in system, so we can't guarantee that the location of every racer will be shown. The live map will be available at https://track.rs/endwet. The river will be marked on river left at every mile, starting at 1 and counting to 36. Please use hashtag #ENDWET if you are posting about the race. We will try to share updates throughout the day but cannot guarantee anything--keeping all the racers safe and supported is more important than posting on social media. It’s a long race and bathroom breaks are inevitable. Support paddlers: be aware there aren’t any enclosed bathrooms along the race course, so you’ll need to find a good place along the river bank to relieve yourself. If you end up needing to go to shore for a pit stop, make sure you discuss how you’re going to communicate this to your swimmer. Swimmers: please be gracious and understand this is unavoidable. We will have an EMT in a boat on the water, but this boat will be there for medical emergencies only (not to supply food, water, Advil, etc.). In the event that a swimmer can’t continue, the best case scenario is to pull out at a manned checkpoint (see above). If this is not possible, then it’s up to the swimmer and support paddler to determine the best course of action. It’s advised that support paddlers keep their phones waterproofed in case of emergency. The race will go on even if it’s raining. In the event of severe thunderstorms and lightning in the vicinity of your location, swimmers who opt to ‘wait out’ the storm on shore will not be disqualified. If the forecast is for a day full of severe storms, we will make a call as to postponement/rescheduling prior to race start. A pre-race email will be sent to all racers and support paddlers at the beginning of race week. This email will include a link to the course book for reminders, a few more finalized details, and any changes that have been made to the race (if applicable). We will also include the swimmer-support paddler pairings in the email to give swimmers the chance to contact their paddlers before they arrive to town. Race Check-in and Guest Speaker. Racers and support paddlers should plan to meet at The 701 coworking space (33 S 3rd St Ste D, Grand Forks, ND) to check in between 5:30 – 6:00pm. We will have a race information meeting at 6:30pm and will give racers a chance to go over plans for race day, mingle, and meet with your support paddler (if not bringing your own). Light snacks will be provided. The guest swimmer talk is scheduled for 7:00 PM on Friday after the race meeting, but you should all be there already anyway. Support Boat Drop. Support boaters using their own boats will either need to drop their boats and gear at the start on Friday night or arrive early to the race start Saturday morning. Support boaters using an ENDracing boat will have their boat transported to the race start by a volunteer on Friday night. A volunteer will camp at the park to watch the boats on Friday night. 2018: A volunteer will be present to watch boats from 4:30 PM Friday until race start. Departure to Race Start. Racers and support paddlers will meet at the finish line on Saturday morning (101 Riverboat Rd, Grand Forks, ND). This is near the finish line and you’ll need to check in when boarding the bus to the race start. Bus departure time is 4:30 AM. Racers and paddlers should leave post-race clothes and items in their cars before boarding the bus. If needed, a small bag can be carried with you on the bus with clothes/items needed on the bus ride (sandals, something to wear, etc.). We will also be collecting resupply bags at this point. These will be dropped partway through the race (mile 15/Thompson Bridge). Race start is at Belmont Park, Buxton, ND. From Climax, MN, drive west across the river (Hwy 220 to 7), take the first right (north) (172nd Ave NE), and turn right (east) after the church. Follow the park road around to the boat ramp. Swimmers will be started 30 minutes after bus arrival, before support boats get put in the water. We've had issues with putting boats in the water first, which eats into daylight. Swimmers, you'll have to survive for a few miles while your boats catch up. Post Race. There will be liquid refreshments at the finish line. There will also be showers available at the Red River Recreation Area campground, just ¼ mile from the finish line. After you’re clean and dry, head over to the Blue Moose Bar and Grill for a free meal and beverage. No activities are scheduled for Sunday, but many people like to get together for brunch/lunch before leaving town. For a complete list of hotels, please check out our friends at Visit Grand Forks. There are some Airbnb rentals in town. Save $40 on your first Airbnb trip. Wherever you stay, feel free to email us after the race and give hotel feedback so we can share. Support paddling is an all-day commitment. Race start is between 6:00 – 8:00 am and most swimmers are finished before 8:00 pm. Since you’ll be paddling and sitting in a boat all day, being in good/decent physical condition is helpful. Feeling comfortable on the water and in a canoe or kayak is important. Having paddling experience is a plus, but is not required. Swimmers will be going at a slow pace and stopping to eat/drink periodically, so being a fast paddler is not necessary. Support paddlers also assist swimmers at their designated food/drink stops. Swimmers will be bringing their own food and drinks that will be kept in your boat. To help ensure swimmers’ safety, we ask support paddlers to text updates to the race director with their swimmer’s location throughout the race. New in 2017: we will be asking support boats to carry a phone or satellite tracker to automatically share locations with a live map (see logistics). Many swimmers like to be in contact with their support paddlers via email in the weeks leading up to the race. Usually, this is to discuss any special instructions or needs that the swimmer has during the race. We will provide swimmers with their support paddler’s contact information. Swimmers will also want to meet their support paddlers before the race. We have race check-in on Friday night before the race and this is a great opportunity for swimmers and paddlers to meet. Please plan on stopping by check-in if you’re support paddling. Check-in time and location to be announced in pre-race email. The course is relatively remote and inaccessible along much of its length. The main spectator points are at Thompson Bridge (mile 15/21 miles to go) and the last eight miles of the course along the Grand Forks Greenway. There is driving access to Thompson Bridge. Some foot travel will be required for access along the Greenway; see map for parking locations. See logistics for a link to the live map (new in 2017).